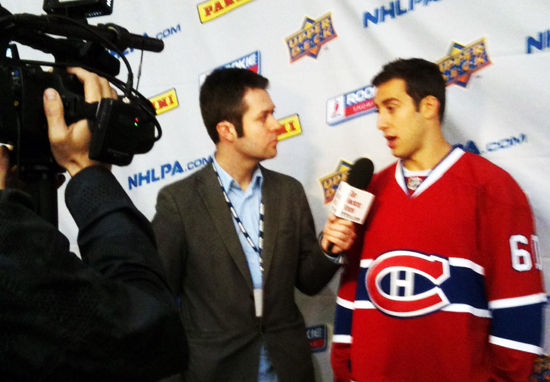 Images from the 2011 NHLPA Rookie Showcase! It’s another big day in Toronto at the 2011 NHLPA Rookie Showcase! Check out these Day 2 images as the rookies hit the red carpet to talk to the media, help Upper Deck shoot some hilarious videos, and more! Stay tuned for more images and updates as this exciting event continues! 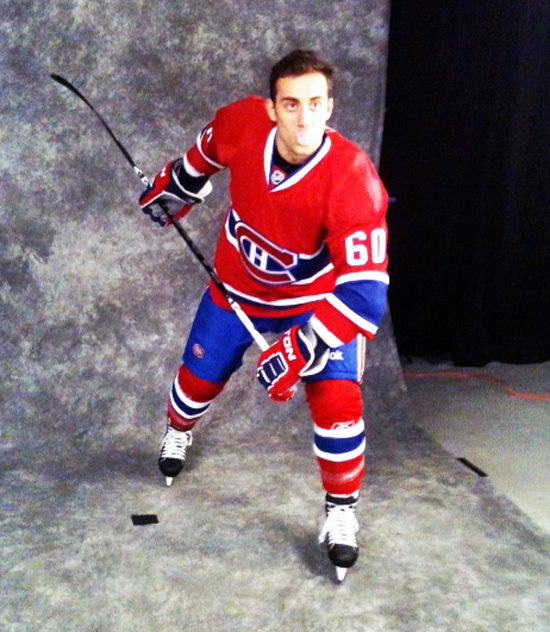 NEXT QUESTION: Aaron Palushaj of the Montreal Canadiens looks very relaxed in front of the camera. 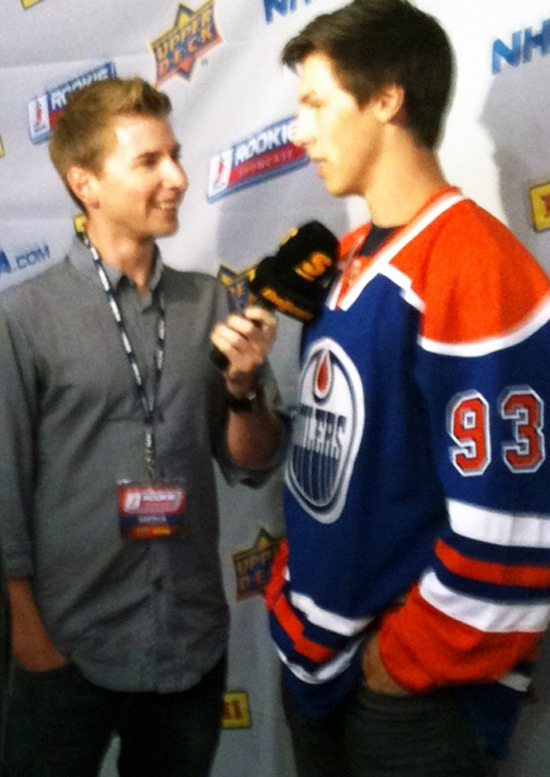 I'M NUMBER ONE: Perhaps Ryan Nugent-Hopkins was talking to this reporter about what it will be like to join the young talent in Edmonton including Jordan Eberle and fellow number one pick Taylor Hall. GOING INCOGNITO: Who's that guy over there with no jersey? It's Carl Klingberg of the Winnipeg Jets keeping it casual on the red carpet. 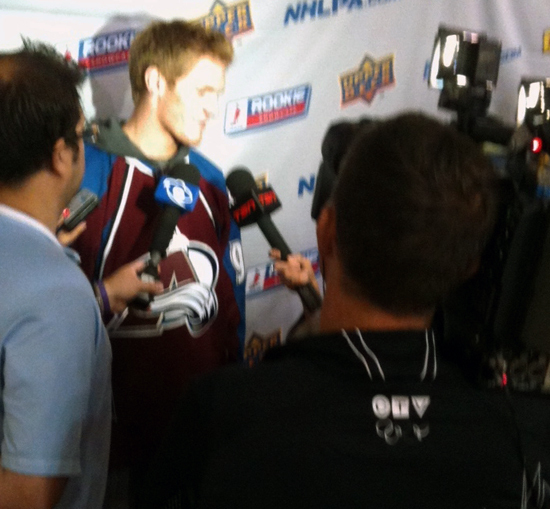 MR. POPULAR: Gabriel Landeskog of the Colorado Avalanche seems to attract a lot of media attention! HOMETOWN HEROES: Jussi Rynnas and Jake Gardiner didn't have to travel far for this event, it was held right in their new team's home city of Toronto. WHAT'S SO FUNNY GUYS? : Gabriel Landeskog and Ryan Nugent-Hopkins can't help but laugh it up as they watch fellow rookie Jonathan Huberdeau film a scene for an Upper Deck video. What is so funny you might ask? You will just have to wait for the video! 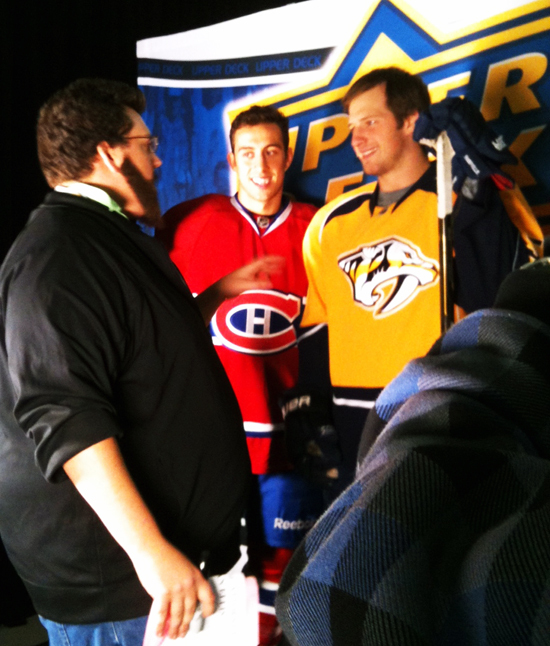 SMILE FOR THE CAMERA: Aaron Palushaj and Blake Geoffrion listen to the director give them some advice while they film a video for Upper Deck. STRIKE A POSE: Aaron Palushaj poses for some Upper Deck photos. Will this shot of him blowing a bubble gum bubble make it onto an Upper Deck trading card? Wait and see! I WANT ONE: Marcus Kruger, Jussi Rynnas, and Jake Gardiner check out an Upper Deck Evolution video trading card. Maybe one day they'll have their own Evolution cards!